As summer slips into autumn, and the nights become a little cooler, the salad days and outdoor living is marred by the huge increase of black and yellow invaders-we’re not talking Richmond Footy Club here, but something even more annoying. The plagues of European Wasps are back! The next month will see even more activity as they prepare to release queens from the nest in April. 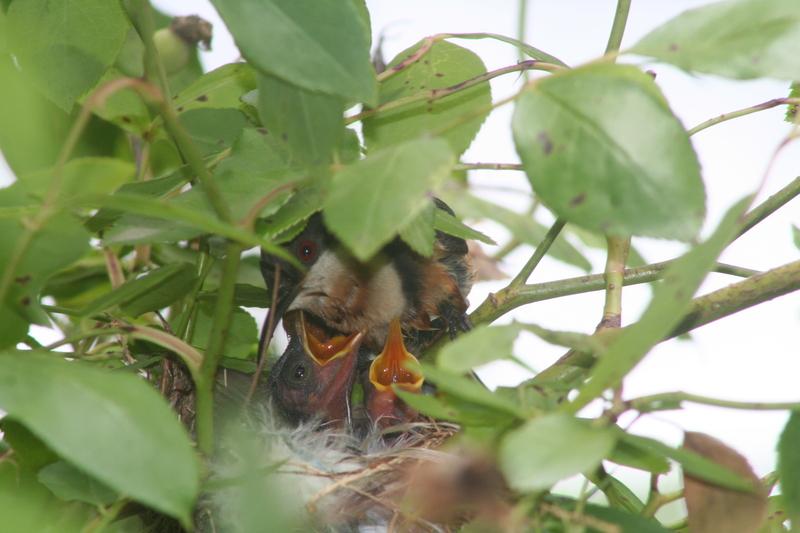 Last season, volunteers from our group located and destroyed 27 nests in our community, free of charge. With Melbourne Pest Controllers charging nearly $200 per nest, that is an effort valued at $5,400 to the people of Flowerdale. This year the problem looks like being even worse with at this stage 15 nests located and destroyed in the last couple of weeks, mainly in Coonan’s and Moore’s Reserves and along Spring Valley Road. We expect to eradicate probably another 40 nests over the next 6 weeks on the current trend, representing $11,000 of donated benefit to the community. Finding the nests can be difficult. The way I do it at this time of year, is to go for a slow walk between 7:45 and 8:30 a.m., when the sun is still low. This enables you to pick up the shine on the wings and work out the direction they are heading. Most times the nest entrances are as big as a 50c piece and in the ground. 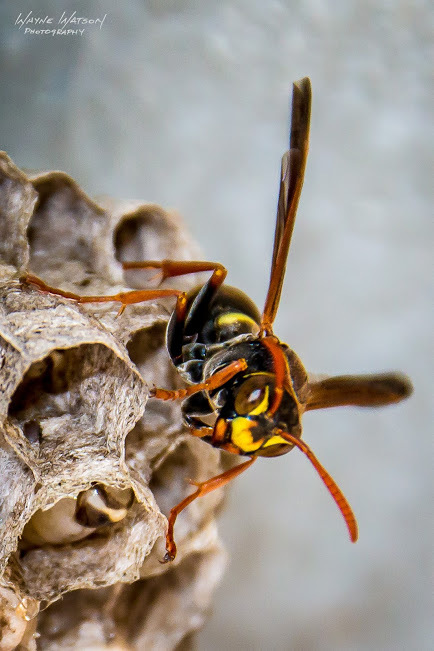 There could be tens of thousands of wasps in the nests, so there is a great risk of being stung badly if you disturb them. I frock up in my bee suit and go to work during the day with pyrmethrin powder and by next morning, when no further activity is observed at the nest entrance, I chalk up another kill. 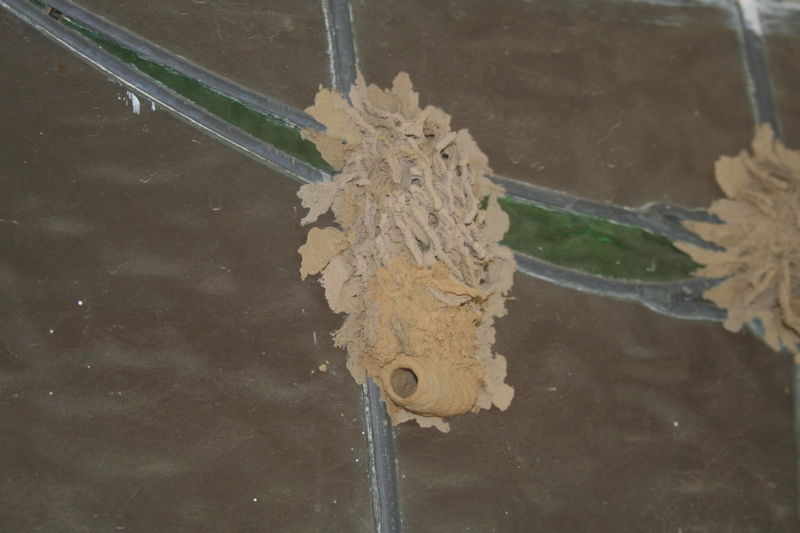 Others wasps nest in small colonies such as those of the paper wasp above. Note the pupa in one of the cells. Thanks to Wayne Watson Photography for use of this image. 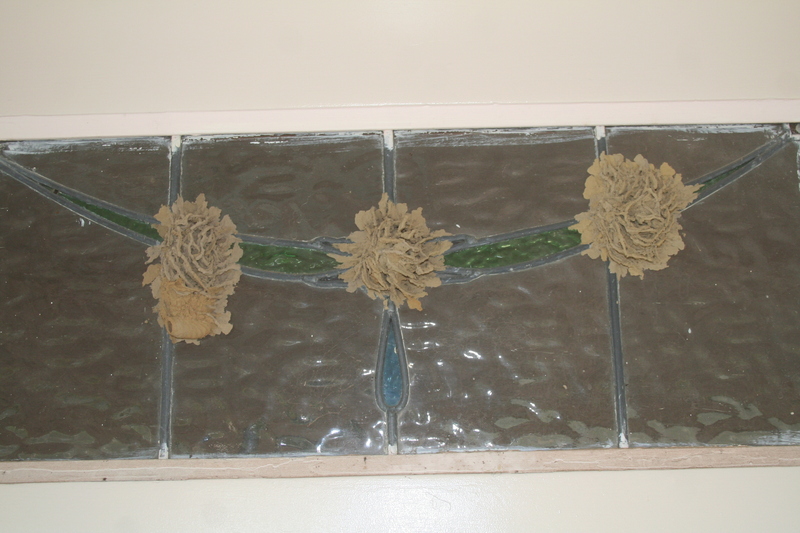 These wasps will defend their nests, so do not interfere! Richmond for premiers – not this year! I don’t know why she swallowed a fly? Australia Day last week and the flies were out in force. 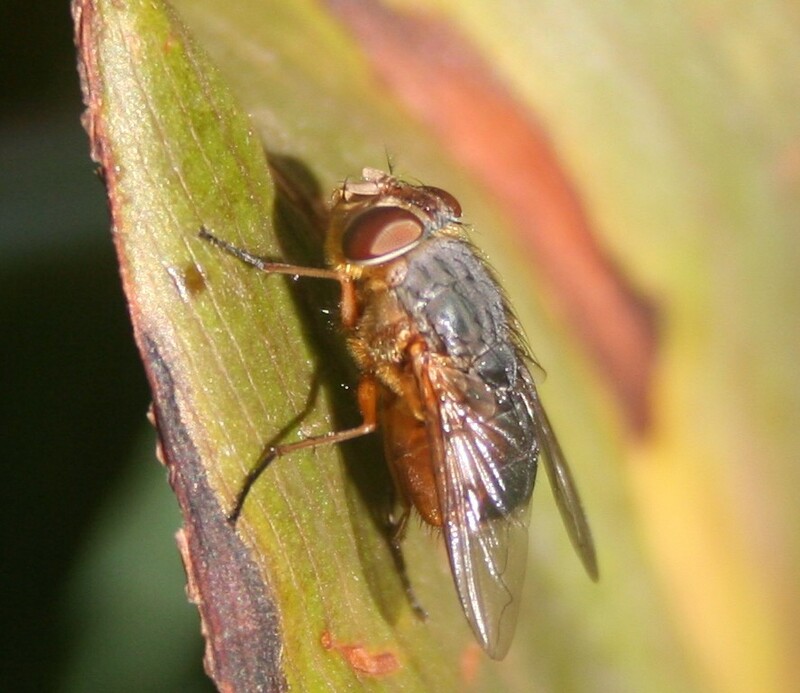 Yes, every fly loves a BBQ. Within a few seconds of the snags, or the prawns hitting the barbie (depending on whether you live in Flowerdale or Double Bay) the ‘meat inspectors’ will be there, from blowies to bluebottles, they are the fair dinkum, true blue Aussies (after snakes and mozzies) and on the 26th of January we saluted them all, bending an elbow, soaking up the sun (slip, slop and slap of course), having a laugh, poking fun at authority and each other. And while we celebrated what is great about this nation we were also mindful that Australia Day for the first peoples of this country is a “sorry” day. One day we will find a better date that we will all be able to celebrate. I acknowledge the hills that embrace us, the creek that flows through us and the Taungurung people, past and present, first people of the district known now known as Flowerdale. 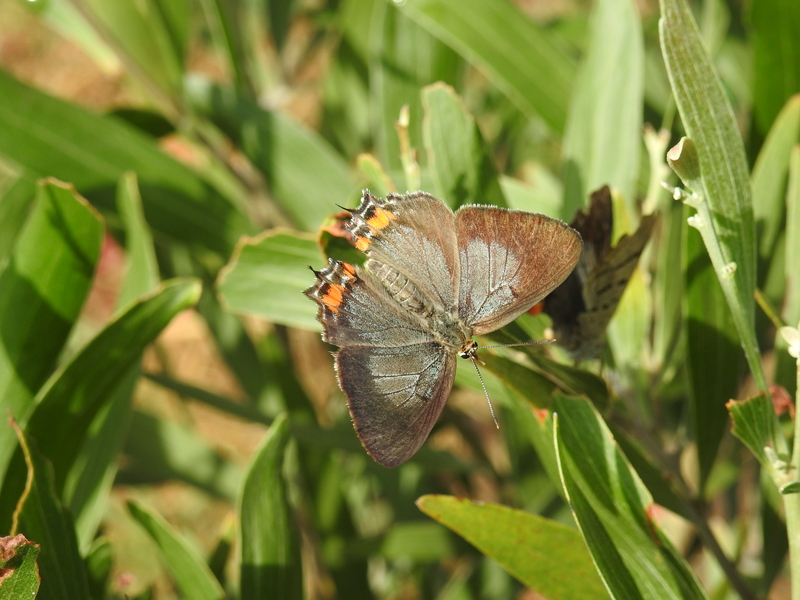 A couple of days ago, Bryan supplied us a grand photo of the underwing of the Common Imperial Blue Butterfly ( https://kingparrotcreekenvironmentgroup.wordpress.com/2016/12/28/so-whats-bugging-you/ ). 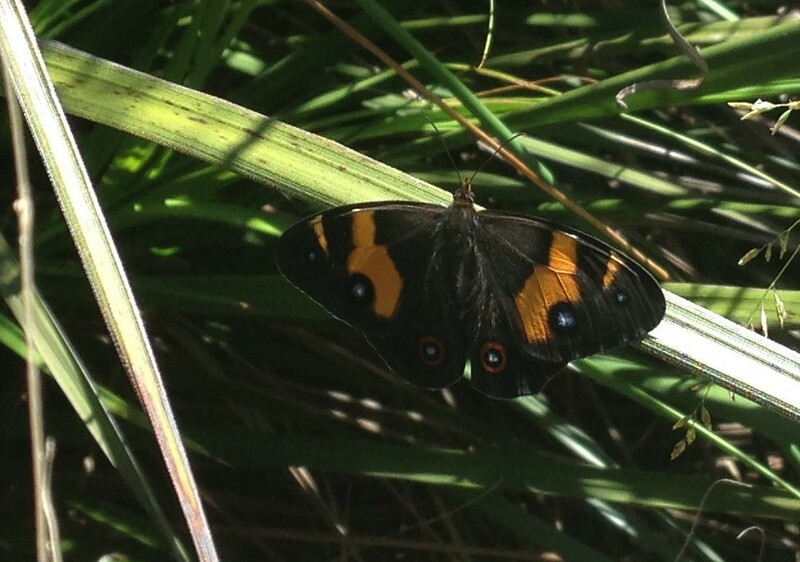 I had no hesitation in setting Bryan the task of obtaining a photo of the same butterfly with open wings. A difficult task as they open their wings for a portion of a second to flash the blue sheen within. A man of patience, Bryan has produced this great portrait to match his earlier effort. About the size of a ten cent piece I’m sure you will agree the C.I.B. is one of Victoria’s prettiest butterflies. Well done Bryan-and if anyone has interesting observations/photos from the Flowerdale environment that they would like to share, please send them in by using the “Leave a Reply” box at the end of this post. Bryan and Kay Milner have become very keen observers of “bugs” in Flowerdale. 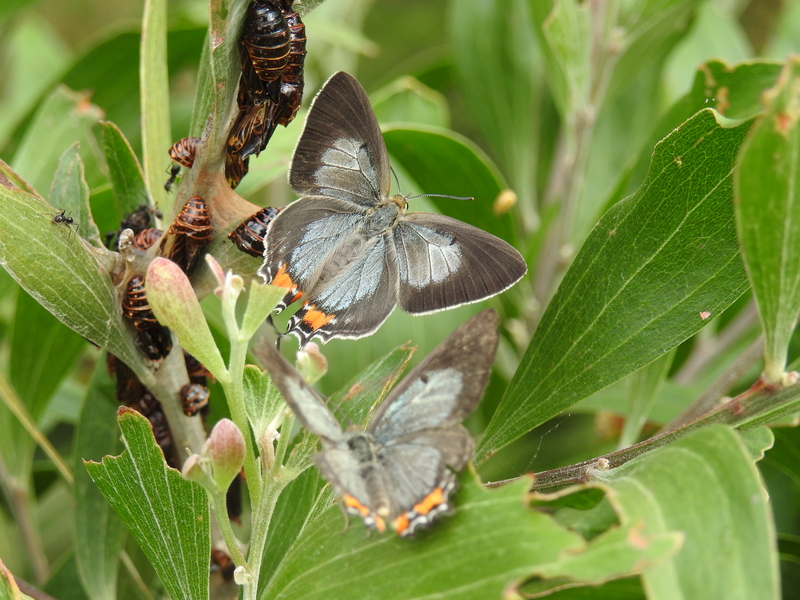 Their latest curiosity was photographed on Blackwood (Acacia melanoxylon) branches, the “bugs” on the left are pupae of the Common Imperial Blue Butterfly (Jalmenus evagoras). The adult stage is in the picture on the right. Note the tails on the lower wings. Also evident in these pictures are black ants (Iridomyrmex sp. ), particularly in attendance of the pupae. A special relationship exists between the ant and this butterfly. The caterpillars/pupae exude a sweet honeydew that the ants like. In return, the ants protect the caterpillars/pupae – and believe me, these tiny ants have a very annoying bite! This relationship is called myrmecophilous or an ant-liking symbiotic relationship. It is possible the butterfly is hanging around the pupae to mate with any female that emerges. 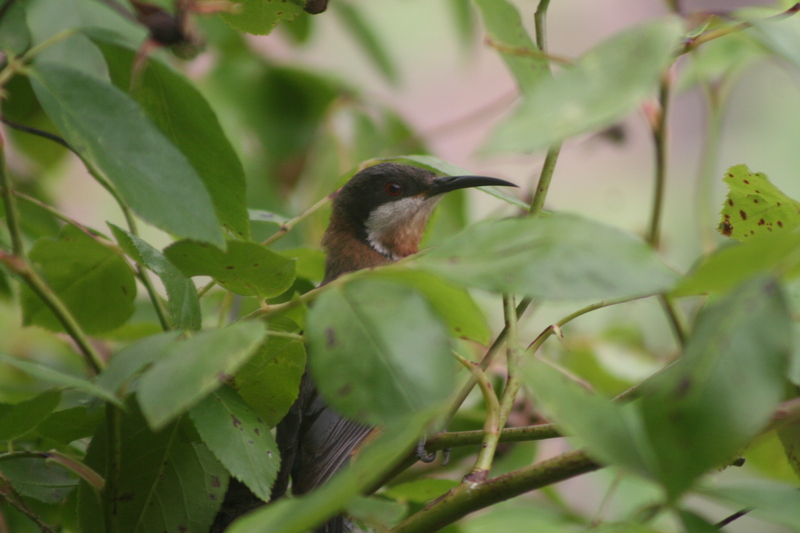 Over the last couple of weeks, we have been excited to see a bird that we have not encountered in the 20 years we have been keeping records in Spring Valley Road, Flowerdale. The Satin Bowerbird (Ptilonorhynchus violaceus) pictured above, normally resides in the higher rainfall areas of the Kinglake National Park and nearby Mt. Disappointment. This individual was spotted one morning taking advantage of pieces of bread normally scooped up by the tribe of magpies that call our property their territory. We were kept entertained by the hopping antics and the strange noises this bird makes for 2 weeks. It seems with the advent of temperatures over thirty degrees, our unexpected visitor has returned to the cooler gullies of the surrounding forests. The last time we were alerted to Bowerbirds in Flowerdale was by Chris Cobern from the Upper Goulburn Landcare Network. You can read further at this link; Ol’ Blue Eyes and the Power of the Bower. If you are in Flowerdale or surrounds, you may have seen the Bowerbird also. Let us know. The butterfly pictured above was photographed at Kinglake last week and is the Swordgrass Brown Butterfly (Tisiphone abeona albifascia). Keep your eyes open for the many species active now the warmer months are here. Breakfast, Bird and Brook, End of year Celebration. We have since engaged in National Tree Day and Schools National Tree Day plantings as well as a successful Broom Busting day at Moore’s Reserve. These activities as always were followed up by a BBQ lunch and beverage. Since then a volunteer blackberry spraying day was again undertaken by the group. Thanks to Paul Michael, Derek Hall and Steve Joblin who put in around 20 hours on this project. Flowerdale Landcare has now turned 3 years old and held the 2nd Great Flowerdale Duck Race last weekend. Last year we had a turnout of 23 people and a real fun day on both the Silver and King Parrot Creeks. This year the Landcare Group decided to have a Picnic on the Lawn at Flowerdale Community House in the hope of attracting locals as part of a Fire Awareness initiative. Long time resident and CFA Fire education officer Judy Baker presented information on developing a family fire plan and staying safe through the fire danger period. Our lunch was provided through grant support from Kinglake Ranges Foundation, which meant that any donations received on the day could be presented to the Flowerdale CFA. Thanks to Viv Phelan for the tasty sandwiches and cakes prepared for us. Flowerdale Landcare president Derek Hall was proud to present Judy Baker with a cheque for $115 which will assist our CFA community volunteers who put in many hours of training on our behalf. (By the way, Madam Secretary Pam Watson’s duck was first under the Bridge which gave her the prize of a meal voucher at the Flowerdale Hotel!). Thanks to our supporters and members Steve and Viv Phelan proprietors of Flowerdale Hotel , for their support. Flowerdale Landcare years end will be officially celebrated again at the Coonan’s Reserve with a breakfast at 8.30 a.m. on Sunday December 13th. Come along and celebrate the achievements of the year, you might even be lucky enough to see a platypus or rakali as we did at lunchtime last year. This gathering will also be the opportunity to confirm events planned for the next 12 months.